Compassion is sometimes confused with empathy, sympathy, pity, and charity. Seeing the definitions may help to clarify the differences. — compassion advocacy, compassion bypass, compassionate action, and applied compassion — can also be confusing. In working with compassion and the terms associated with it, we incorporate the "five bodies" concept — a way of punctuating human existence so that we can better understand what it is to be a human being. Physical body — The physical manifestation of a person. Emotional body — The feeling nature of a person. Mental body — The creative and thinking nature of a person. Situational body — The physical, emotional, and mental milieu in which a person exists. This body represents the circumstances in which one finds oneself. 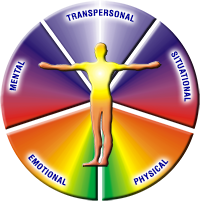 Transpersonal body — The profound, transcendent knowledge, aspirations and beliefs of a person. Some people incorporate religious practice into the regimen for their transpersonal body (and, thus, is sometime referred to as the "spiritual" body). Each body communicates with and impacts the other bodies. 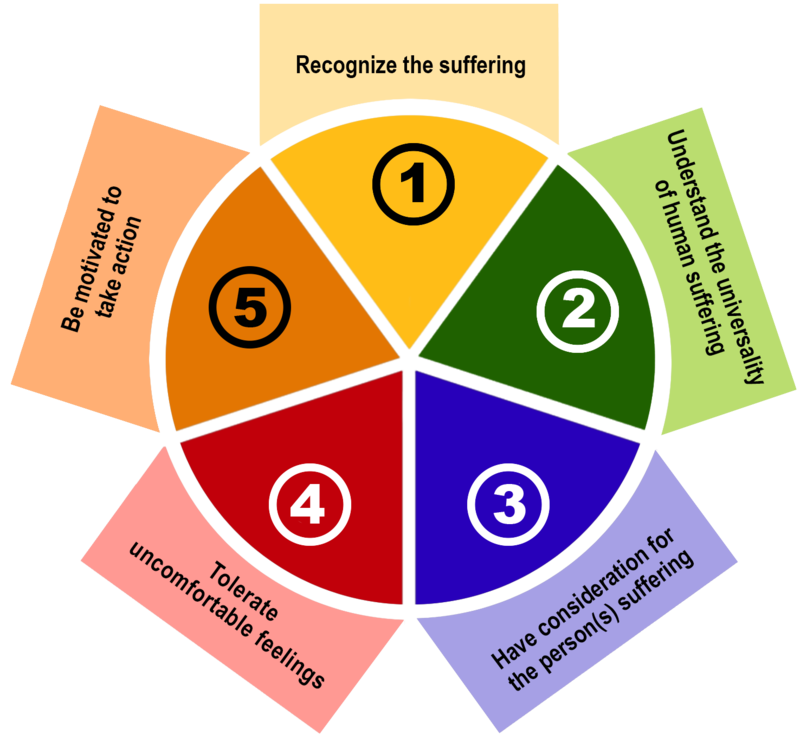 We often view "suffering" (refer to the discussion below) through the lens of the five bodies (e.g., physical suffering, emotional suffering, etc.). Understanding the universality of human suffering. Consideration (emotional and or mental) for the person suffering. Motivation to act/acting to alleviate suffering. Courage — The courage to take compassionate action, especially when it presents difficulties. Commitment — The commitment to engage suffering, especially when obstacles are present. Competency — Having the requisite understanding and skills to effectively take up compassionate action. These skills can be learned. Compassion Advocacy — The act of raising awareness about the nature and need for compassion. A misinterpretation (often innocent) of what constitutes compassion. Acts which are confused with pity, charity, being nice, etc. — all of which are part of a greater constellation of caring behaviors that can be valid in their own right, but are not "compassion." Creating an appearance of compassion as a means to avoid the courage, commitment, and competency required for meaningful compassionate action. The absence of humility (e.g., focusing on becoming "compassion celebrities" or "compassion stars"). The need for physical, emotional, mental, social, or transcendent pay-off (not to be confused with rewards that come naturally and without demand or expectation). "Keeping score" of one's compassionate actions to impress one's self and others with one's compassionate deeds. The absence of emotional or intellectual commitment in the act. The focus on single, self-gratifying acts for which one has little investment. Claiming compassion when engaging in acts that do nothing to directly alleviate suffering. Dodging the messy work often demanded by compassion, such as extending compassion to those one finds disdainful (e.g., those with differing political beliefs, those who have engaged in destructive behavior). An unwillingness or inability to tolerate uncomfortable feelings that accompany deep compassion work. Does the act prevent or respond to suffering? Does the person exercising the compassionate act have an emotional and/or intellectual connection to the suffering? Does the exercise of the compassionate act exact a price (physically, emotionally, mentally, situationally, and/or transpersonally) upon the person exercising that act? Applied Compassion — The practice of employing compassion in specific cases as part of the process to prevent or alleviate suffering. Assimilative and Nonassimilative Compassion — Two internal forms that expressions of compassion can take. Assimilative Compassion — This form of compassion occurs when one takes on and internalizes the pain of those who are suffering. This form of compassion is toxic and can expand the scope of the suffering to include those concerned about or attending to the original person experiencing suffering. This assumption can negatively impact the resolution of the original suffering and generate relational confusion. Assimilative compassion is also a strategy to shift attention from someone who is suffering and transferring the focus to one's self. Nonassimilative Compassion — Those who engage in nonassimilative compassion feel for the suffering of others, but recognize that the pain they is see is not theirs. They can then fully engage in supporting those in pain without adding to scope of that suffering. Compassion Aversion — A condition in which a person has developed a resistance to compassionate treatment from the self or others. The condition is characterized by an inability to deal with compassionate responses to suffering due to psychological stress, overwhelm (flooding), sense of worthlessness, disbelief, or suspicion. Attempts to continue exercising compassionate behavior can aggravate the condition. The application of compassion must be titrated to meet the ability of the person who is suffering. Empathy — The intellectual identification with or vicarious experiencing of the feelings, thoughts, or attitudes of another. Empathy incorporates cognitive elements that allow us to see through the eyes of others and to value their welfare.3 Since it is a skill (not an emotion or motivation), it can also be used maliciously. Used in a caring way, empathy is the first step in engaging compassion, pity, or charity. It is an interpersonal attunement that can connect one person of another's joy, excitement, setbacks, and suffering. When suffering is involved, empathy is the gateway to compassion: the first step to the compassion experience. Sympathy — The fact or power of sharing the feelings of another, especially in sorrow or trouble. Pity — Sympathetic or kindly sorrow evoked by the suffering, distress, or misfortune of another, often leading one to give relief or aid or to show mercy. Charity — Generous actions or donations to aid the poor, ill, or helpless. Necessary Suffering — Painful experiences that are not directly health or life-threating. For example, when a young child learns that they are not allowed to take a toy away from another child, they may experience loss, disappointment, and hurt. This is, indeed, suffering, but it is also part of the child's learning. Such lessons are essential to building depth and resiliency. For adults, first degree suffering can take the form of loss of a loved one, the pains of aging, uncertainty, and other common experiences that come with one's existence. Although necessary, the experience still merits compassion. Non-crippling or Non-fatal Suffering — These painful experiences consist of anxiety, stress, despair, illness, injury, or loss that does not cripple or threaten life. Examples are divorce, job loss, temporary sickness, indebtedness, intolerance, shaming, injustice, and exploitation. Crippling or Suffering that Risks Death — The most severe form of suffering, this category includes experiences such as crippling injuries or diseases, severe physical and/or emotional trauma, starvation, social group extermination, aggravated assault, murder, fatal exposure to the elements, and fatal diseases and injuries. The challenge of suffering includes, but is not limited to, endemic rage, racism, corporate exploitation, intimidation, terrorism, hate, intolerance, human trafficking, assaults on women, suicides, torture, political corruption, bigotry, shaming, child abuse, debt slavery, demonizing, rancor, homelessness, bullying, extreme income inequality, manufactured fear, pollution, injustice, and despair. In the United States, an estimated 35% of adults are in collection for defaulting on their credit. With the economic meltdown in the last decade, 8,8 million people lost their jobs and 1.2 million lost their homes. About one in eight American’s were abused as children. Research suggests that 350 million people worldwide struggle with depression. A report by the London School of Economics and Political Science at King’s College London estimates that depressed employees cost European businesses €96 billion (£77 billion, US $129 billion). The World Health Organization (WHO) estimates that each year approximately one million people die from suicide. WHO also reports that, in the last 45 years, suicide rates have increased by 60% worldwide. Suicide is now among the three leading causes of death among those aged 15-44 (male and female). In 2012, there were a total of 2,044,270 reported incidents of crime against women in India. African-Americans comprise 13% of the U.S. population and 14% of the monthly drug users, but 37% of the people arrested for drug-related offenses in America. In the United States, 1 in 4 women and 1 in 6 men will be sexually assaulted before the age of 18. In the United Kingdom, 200,000 Muslims who turn away from their faith are faced with abuse, violence and even murder. Those in the grips of this suffering lead, work, volunteer for, or otherwise participate in organizations. People struggling with the loss of their job or home, a death in the family, chronic illness, threats from bill collectors, violent crime, discrimination, failure, a devastating childhood and/or experiencing a bleak existence will deal with workplace challenges differently than those who are not plagued by similar torment. Recognizing and and responding to organizational and personal suffering is an important element in moving organizations toward greater ethical, financial, and sustainable success. 1. Much of the material for this page is taken from the book (in development), Compassion and the Alchemy of Being, by Ari Cowan. Reproduced with permission.